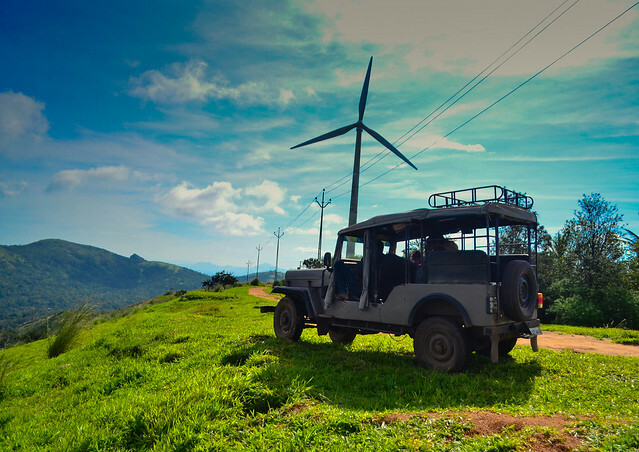 Located in Idukki District along the border of Tamil Nadu and Kerala, Ramakkalmedu is small hamlet in the hills famous for its wind farms. From Ramakkalmedu, one gets an amazing view of the hills and villages around. The lush meadows resemble a green carpet wrapping up the hillock. At dusk, when viewed from atop, the lighted up towns and villages are simply feast for our eyes. Clean air and tranquil ambience relaxes our soul and body. Amidst of greenery, the hillock also has its own historical importance in the form of Statues of Kuravar and Kurathi Statue. This statue describes the role played by the hillock in Sangam period. Though many tourists visit Ramakkalmedu, it has not been commercialized too much yet, so there are not many facilities for tourists available. Ramakkalmedu is about 40 Kms from Thekkady and 70 Kms from Munnar.